The Black Onyx Micro-Chenille Wash Mitt holds volumes of water, soap solution, and cleaners in its long microfiber fingers. In fact, the microfiber fingers are 40% larger than standard micro-chenille wash mitts. The Black Onyx Micro-Chenille Wash Mitt is fortified with a double-stitched cuff as well as a soft double-insulated liner. The result is a comfortable mitt that is also durable and is suitable for all of your detailing needs. Not only is the Black Onyx Micro-Chenille Wash Mitt durable, but it also features densely packed, ultra long, and extremely plump microfiber fingers that sweep into the hardest to reach areas for safe and effective cleaning. 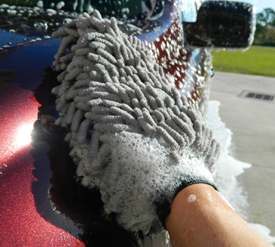 Each microfiber finger is covered in the softest microfiber to prevent swirl marks and wash marring. This mitt pampers what ever surface you are cleaning. For best results, and to reduce the chance of creating swirl marks, rinse the wash mitt in a fresh bucket of water frequently while you wash. The Black Onyx Micro-Chenille Wash Mitt is color coded the same as our black All Purpose & Wheel Detailing Cloth. While the Black Onyx wash mitt is more than suitable for paint, we recommend color coordinating your microfiber towels to prevent cross contamination. It is another example of how BlackFireWax.com makes detailing fun and easy by eliminating the guesswork. 11 x 8 inches.